The YZF-R1M® features a lightweight and compact crossplane crankshaft, inline-four-cylinder, 998cc high output engine. Featuring a first ever for a production motorcycle, titanium fracture split connecting rods delivering extremely high horsepower and a strong pulse of linear torque for outstanding performance. The YZF-R1M features the most advanced MotoGP®-inspired electronics package ever offered on a supersport machine: a full suite of inter-related technologies, enabling the rider to enjoy the fullest range of performance with great comfort, control, and ease of operation. 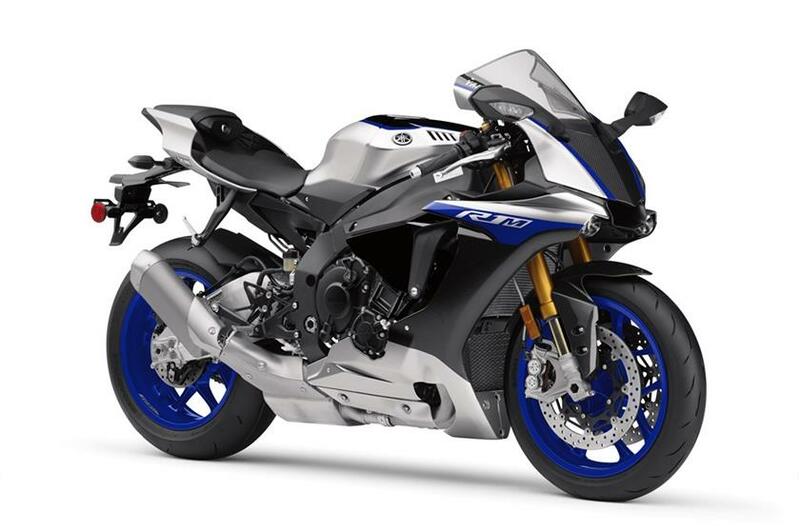 The YZF-R1M features an Öhlins® Electronic Racing Suspension (ERS), carbon fiber bodywork, and a Communication Control Unit (CCU) with GPS that enables the rider to capture ride data (including GPS tracking) and then download it via WiFi to the Yamaha Y-TRAC smartphone and tablet app. Once the data is downloaded, the rider can analyze it overlaid with the track map. Setting changes can then be made via the YRC Setting app and uploaded back to the R1M. 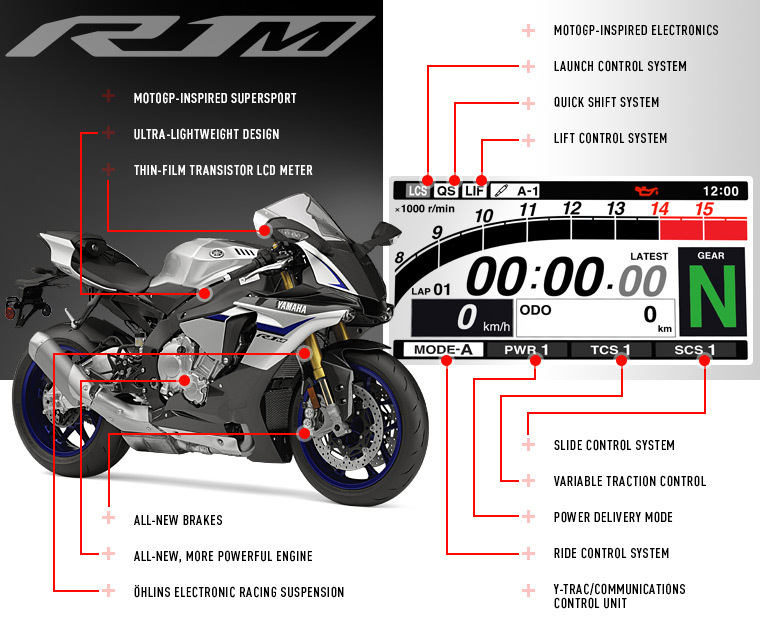 Featuring the first six-axis Inertial Measurement Unit (IMU) ever offered on a street-going motorcycle, the R1M represents the dawn of a new digital era where all riders can experience total 3D controllability. IMU consists of a gyro sensor that measures pitch, roll, and yaw, as well as an accelerometer, or G-sensor, that measures acceleration in the fore-aft, up-down, and right-left directions… all at a rate of 125 calculations per second. By calculating each signal, the IMU finds the precise vehicle position and movement, and communicates it to the ECU, enabling it to control the bike’s systems. The R1M is fully equipped with banking-sensitive Traction Control, as well as Slide Control, Wheel Lift Control, Quickshifter, Launch Control, ABS, a Unified Braking System, and much more. The all-new R1M gives street riders, track day participants, and full-on racers an unmatched and unprecedented level of rider-adaptive performance. Advanced aluminum Deltabox® frame uses the engine as a stressed member of the chassis and is designed to provide the optimum balance of longitudinal, lateral and torsional rigidity. A midship-layout exhaust system with titanium headers and muffler canister is positioned low and in the middle of the chassis for improved mass centralization. 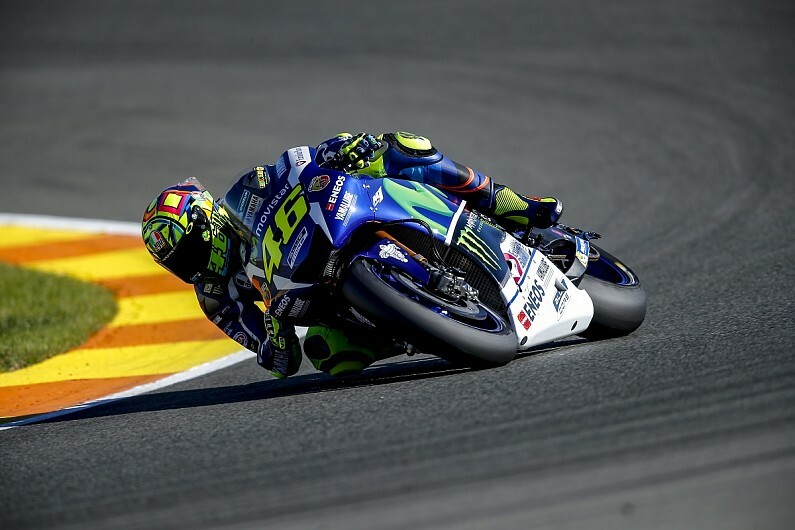 The styling on the new R1M is inspired by the YZR-M1, purposely sculpted for maximum aerodynamic efficiency.